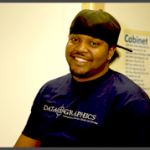 Custom Identification Labels for All Your Naming Needs | Data Graphics Inc. Custom Identification Labels for All Your Naming Needs | Data Graphics Inc.
With more than 30 years of experience manufacturing custom identification labels for product and equipment identification, our specialists know what you expect in a nameplate manufacturer. 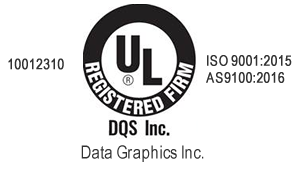 Whether you need an identification nameplate for equipment, hardware or other products, Data Graphics can deliver the solution that meets your exact specifications. This includes business branding. We manufacture logo nameplates that are affixed to products and sold on the open market to end users. Those nameplates give your product a unique identity that customers come to recognize. We also have experience producing the identification nameplates that list the make, model and product manufacturer. Depending on your needs, an identification nameplate can be made to withstand exposure to almost any element in the environment. Polycarbonate is one of our most popular materials for ID Nameplates because of its dimensional stability and superior printing quality. Polycarbonates are plastics that can withstand prolonged exposure to extreme temperatures, corrosive chemicals, impacts, abrasions and intense ultra-violet rays from the sun. Our sales staff can assist you in picking out the material that’s right for your product. Why Choose Our ID Labels and Identification Nameplates? Customers choose our ID labels and identification nameplates for the exceptional service and printing options. Data Graphics’ state-of-the-art facility in Mount Dora, Florida has the most up to date printing presses on the market today. This allows us to choose from a wide variety of printing methods, offering you even more flexibility and pricing options, which leads to better, clearer, more durable custom identification labels for you. Our printing presses offer crisp, clear printing quality that lasts. You can choose to have your nameplates screen printed, flexographic printed, thermal printed, hot stamp printed or digitally printed in four color process. We can also do laser etching or engraving, depending on your custom identification labels. Reach out to a Sales Engineer today for a quote on the custom ID label, sticker or nameplate you need.